Where you live is an important factor when it comes to stocking your closet and making certain landscaping decisions. But could your geographic location also determine the quality of your relationship? Maybe so, according to a new study by a Michigan State University researcher, which found that some states may be more conducive to healthy relationships than others. Mississippi, Utah, and Wisconsin were found to be the top states for lovers, while North Dakota and the Great Plains (South Dakota, Kansas, and Colorado) ranked in the bottom 10 for quality relationships. 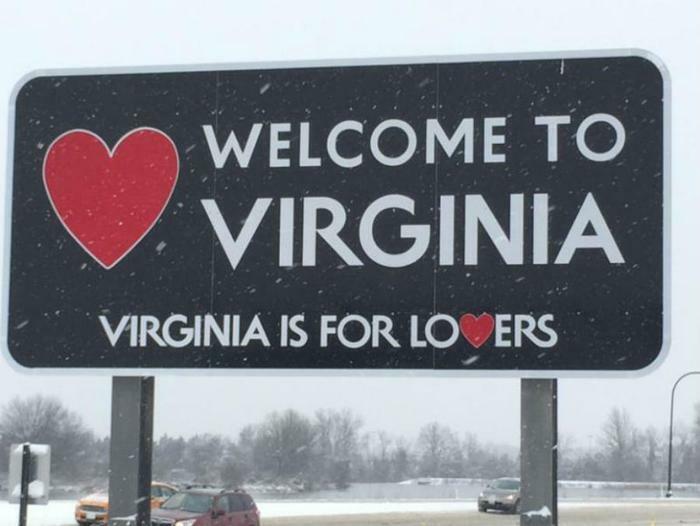 And “Virginia is for lovers” seems only to apply if your true love is history. Virginia actually received a mediocre ranking in the study, which measured attachment anxiety and attachment avoidance in 127,000 adults from every state. Many states fit their respective stereotypes, said lead researcher William Chopik, an assistant psychology professor who studies relationships and their effects. The state of New York, for example, was deemed ninth worst for lovers, while California and Utah were both in the top 10. "When I think of New York, I think of the anxious Woody Allen type, and New York had one of the highest scores for attachment anxiety," Chopik said in a statement. "California, on the other hand, seems like a romantic place with beautiful sunsets, oceans and warm weather. And Utah residents are known to be very nice, warm and generous, which many people attribute to the large Mormon population." For the study, Chopik and his colleague Matt Motyl of the University of Illinois at Chicago looked at levels of attachment anxiety (often referred to as “clinginess”) and attachment avoidance (whether the individual dislikes intimacy and tends to be more distant toward their partner). Because neither characteristic sets the stage for a healthy relationship, the best states for lovers were those that scored low on both measures. Top states for lovers also had high marriage rates and low numbers of people living in isolation. The Pacific coast was found to be the top region for quality relationships, while other high-ranking states included Vermont, Alaska, North Carolina, Delaware, Minnesota and Oregon. The worst states for lovers had the highest attachment anxiety and avoidance scores. North Dakota ranked the worst for quality relationships, followed by Kentucky, Kansas, South Dakota, Rhode Island, Ohio, South Carolina, Colorado, New York, and Indiana. Certain states (especially those with secluded mountainous areas) may cater to loners, while the weather and temperature in other regions might promote more positive interactions, the authors noted. But romantically-challenged residents of North Dakota shouldn’t take these findings as a sign that it's time to move. “To a certain degree, positive relationships are found everywhere and transcend time and place,” the authors concluded. “After all, home is where the heart is." The study has been published in the Journal of Research in Personality.